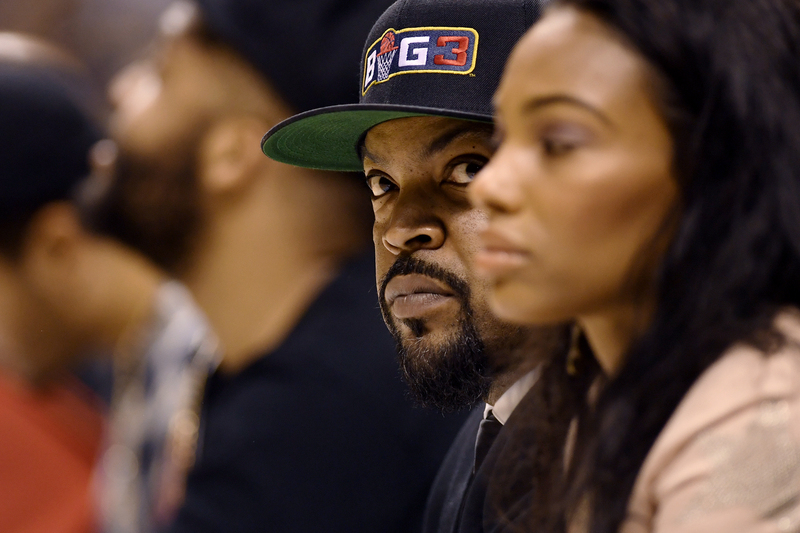 Ice Cube sits court side during the Big3 third place game at the MGM Garden Arena. 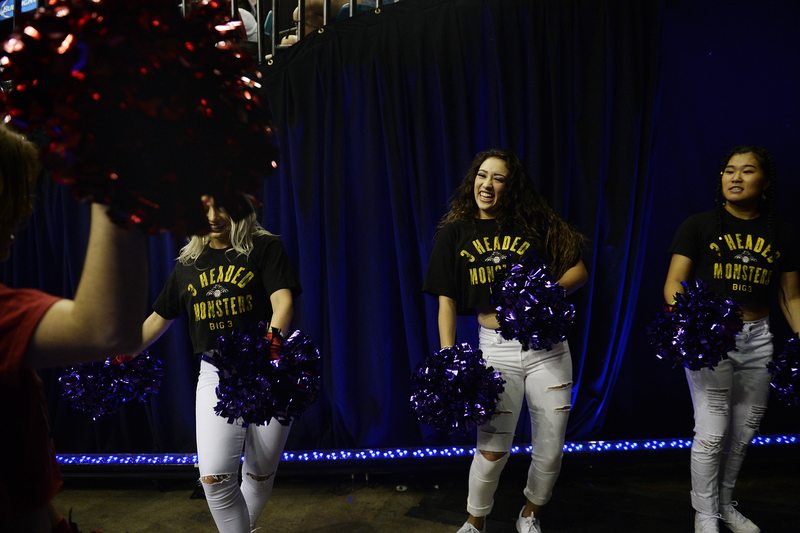 Ladies of the BIG3 warm up before introductions during the BIG3 championship game at the MGM Grand Garden Arena. 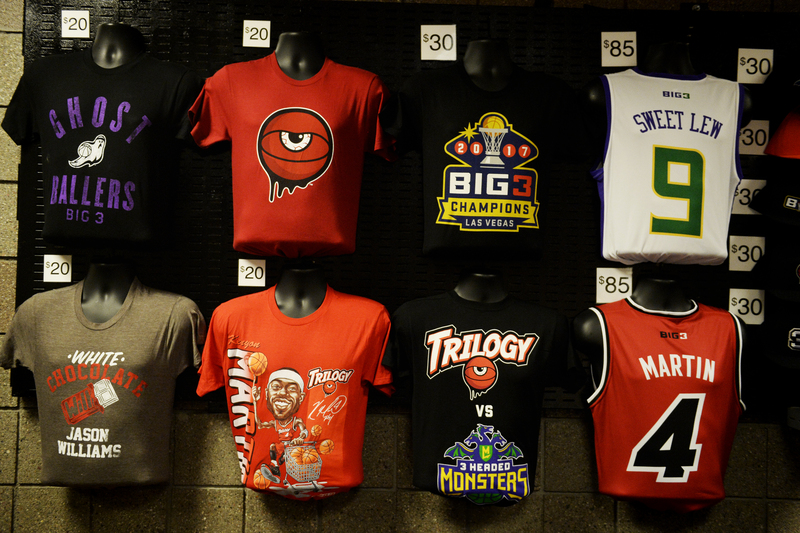 BIG3 gear on sale on the concourse during the BIG3 third-place game at the MGM Grand Garden Arena. 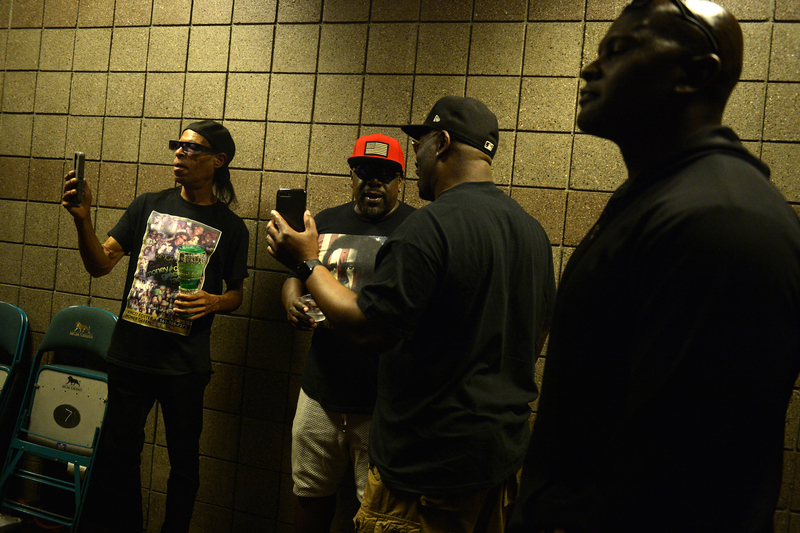 Cedric the Entertainer (second from left) entertains folks in the back hallways during the BIG3 championship game at the MGM Grand Garden Arena. Mahmoud Abdul-Rauf (No. 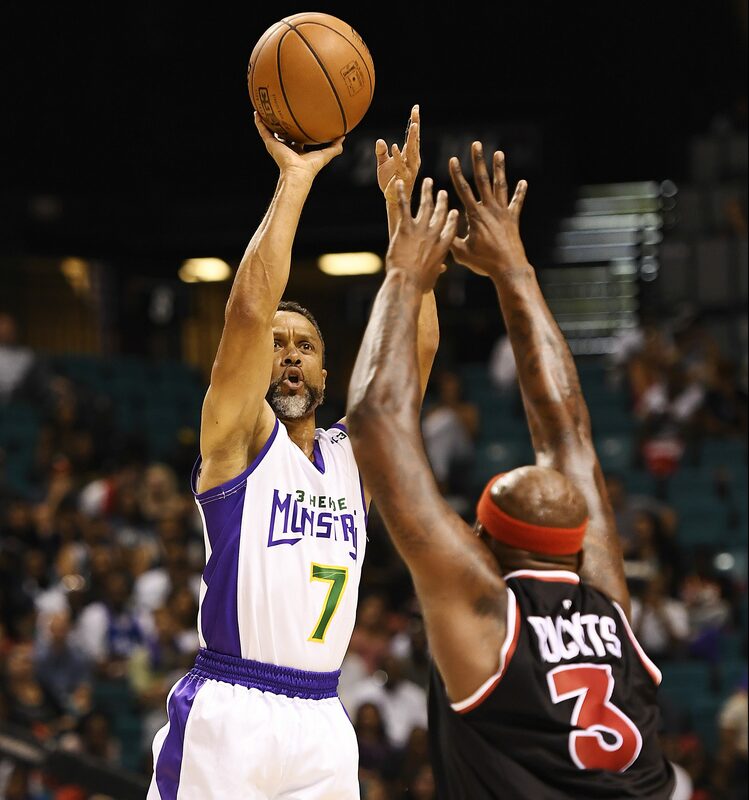 7) of 3 Headed Monsters receives an inbound pass against Trilogy during the BIG3 championship game at the MGM Grand Garden Arena. Trilogy won the title 50-46. 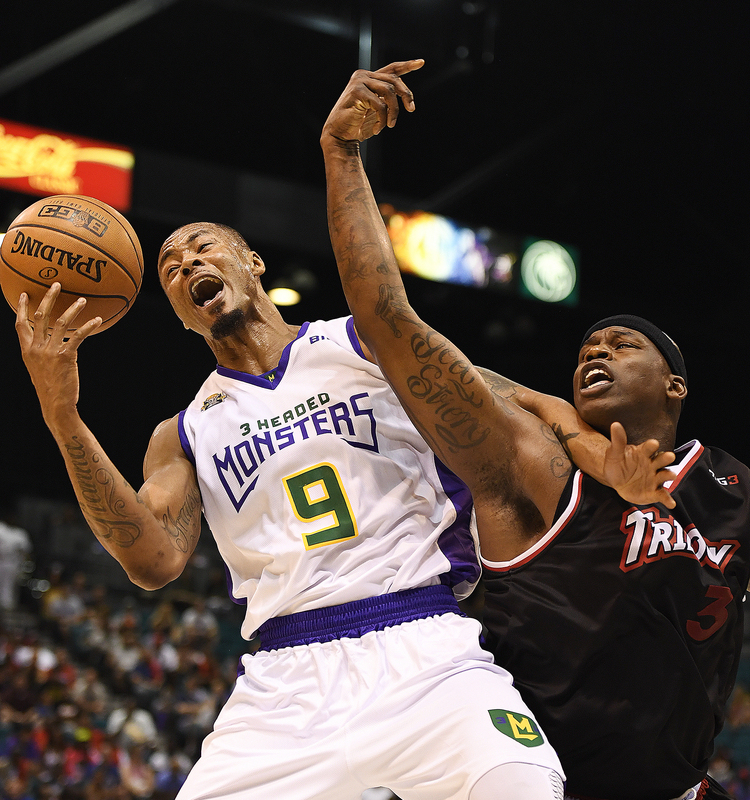 Rashard Lewis (No. 9) of 3 Headed Monsters fouls James White (No. 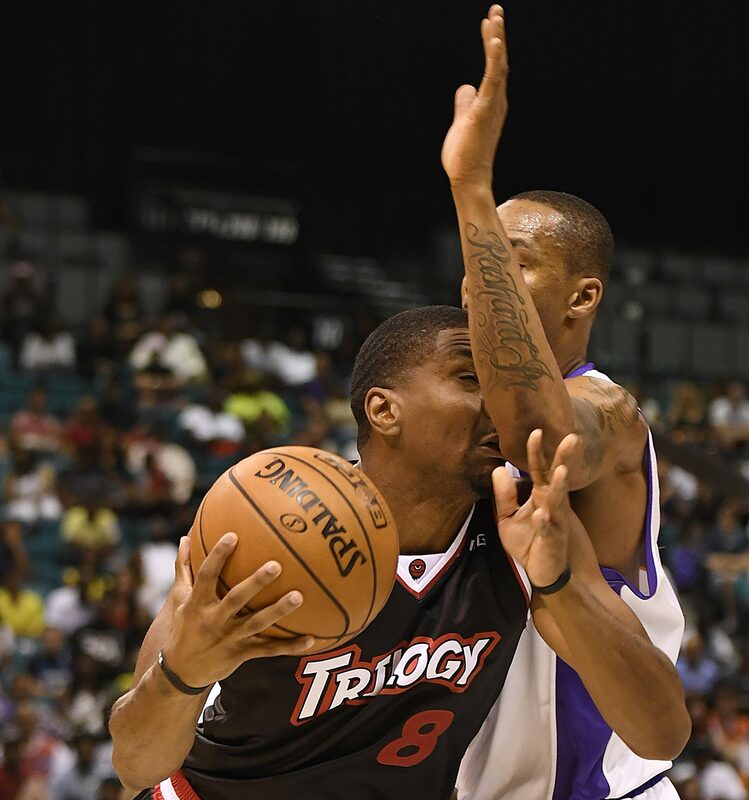 8) of Trilogy during the BIG3 championship game at the MGM Grand Garden Arena. Mahmoud Abdul-Rauf (No. 7) of 3 Headed Monsters shoots over Al Harrington (No. 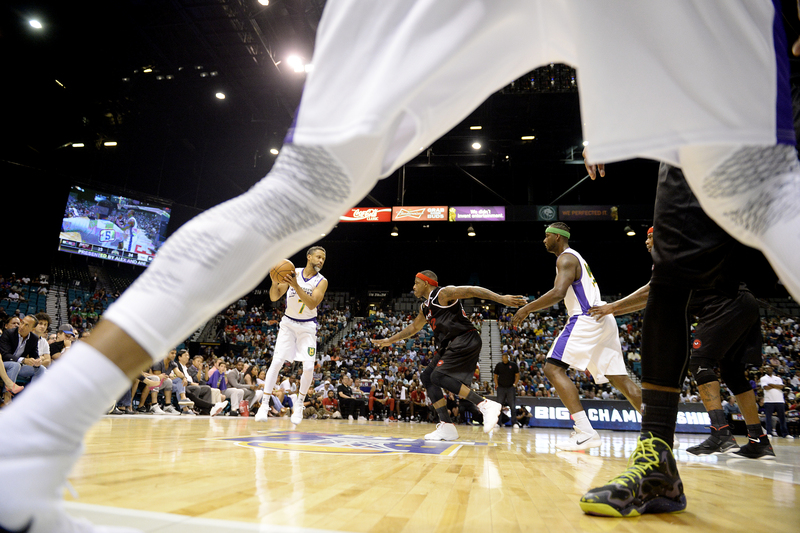 3) of Trilogy during the BIG3 championship game at the MGM Grand Garden Arena. Fans watch a halftime performance by Cardi B during the BIG3 championship game at the MGM Grand Garden Arena. Cardi B performs at halftime during the BIG3 championship game at the MGM Grand Garden Arena. 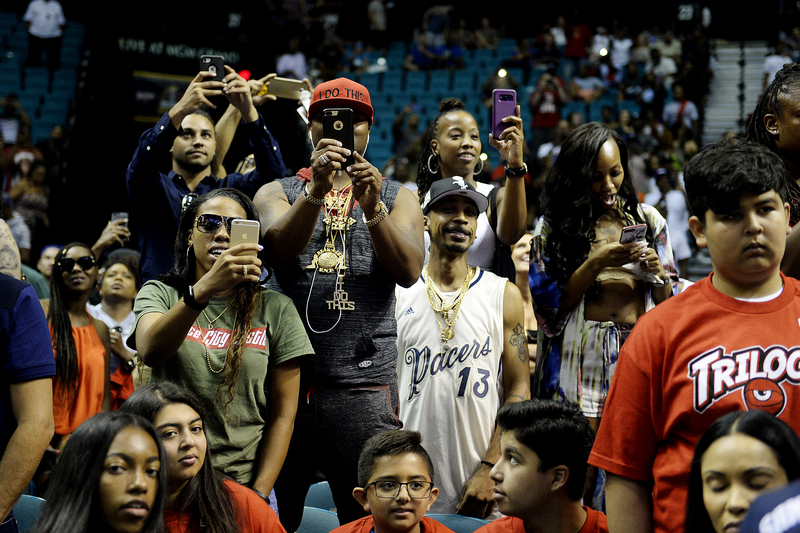 Cardi B performs at halftime as Ice Cube (second from right) and Curtis “50 Cent” Jackson (right) watch during the BIG3 championship game at the MGM Grand Garden Arena. 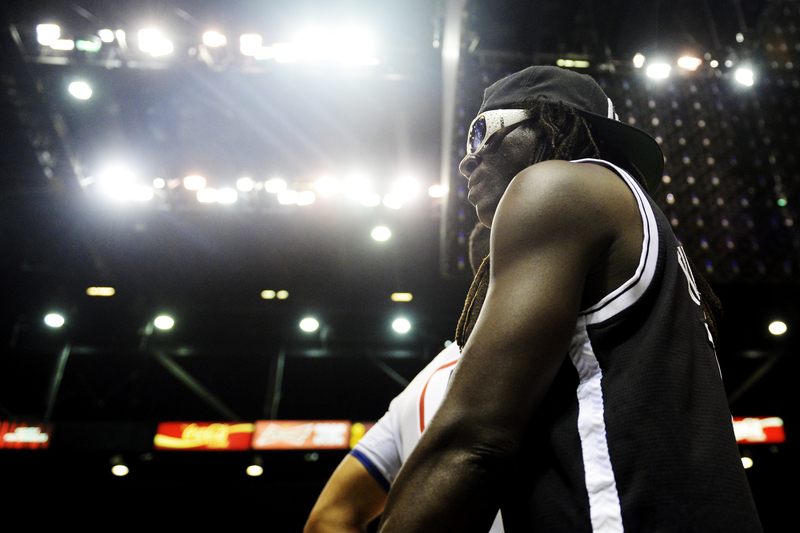 Flavor Flav works the scene courtside during the BIG3 championship game at the MGM Grand Garden Arena. Kareem Rush (No. 21) of 3 Headed Monsters is blocked by Rashad McCants (No. 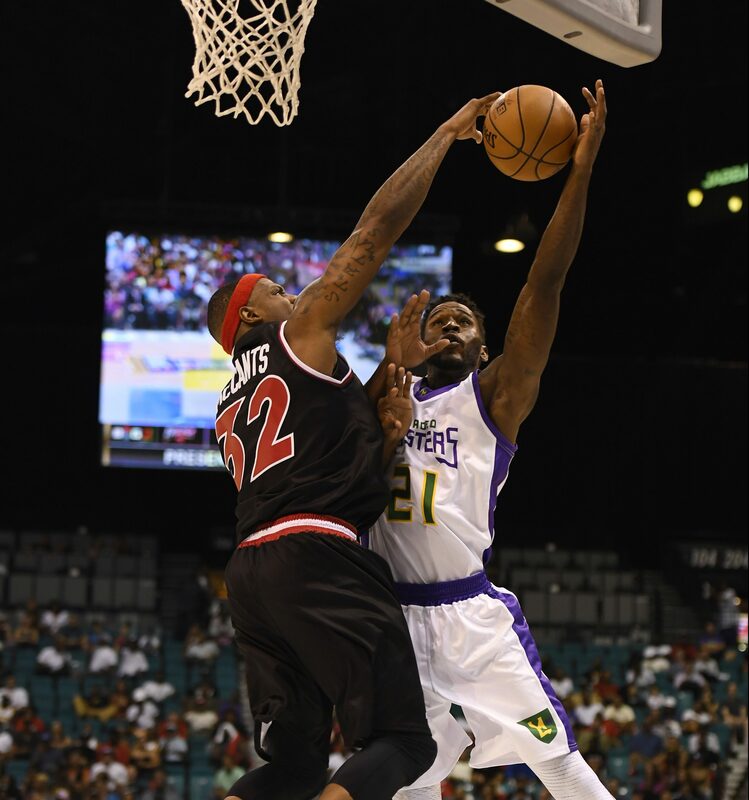 32) of Trilogy during the BIG3 championship game at the MGM Grand Garden Arena. Al Harrington (No. 3) of Trilogy battles Kwame Brown (No. 54) of 3 Headed Monsters down low during the BIG3 championship game at the MGM Grand Garden Arena. 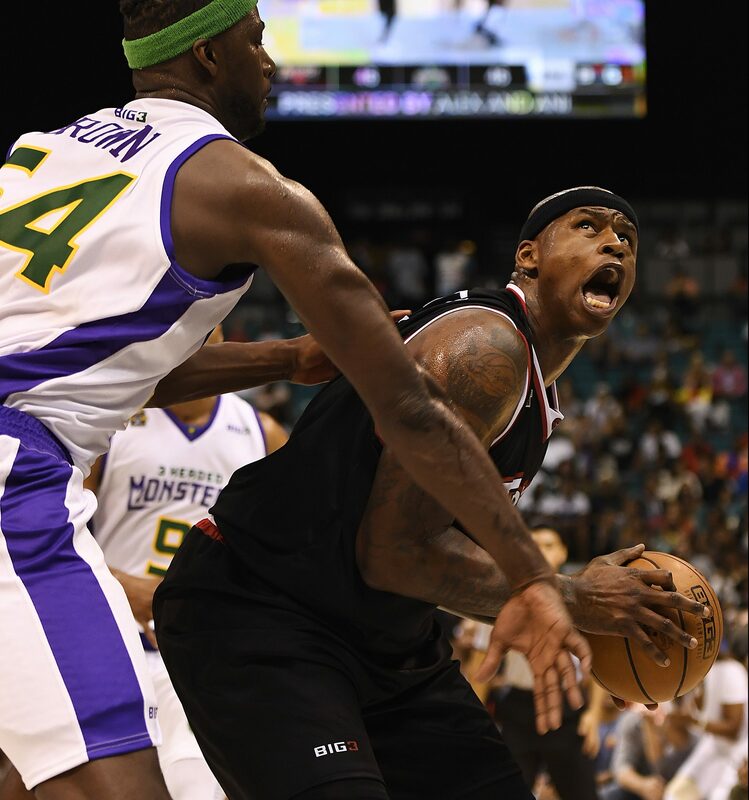 Al Harrington (No. 3) of Trilogy and Rashard Lewis (No. 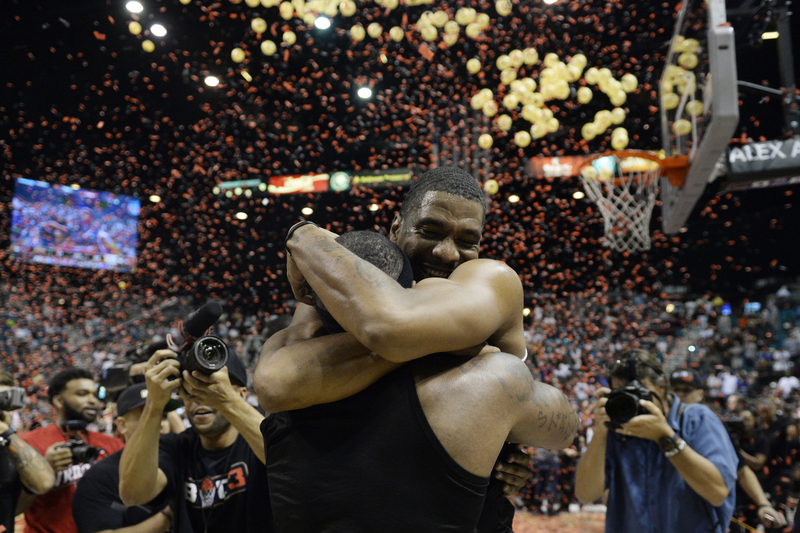 9) of 3 Headed Monsters tangle during the BIG3 championship game at the MGM Grand Garden Arena. Trilogy captured the league’s first league title by beating 3 Headed Monsters 50-46. James White (No. 8) of Trilogy hugs Rashad McCants (No. 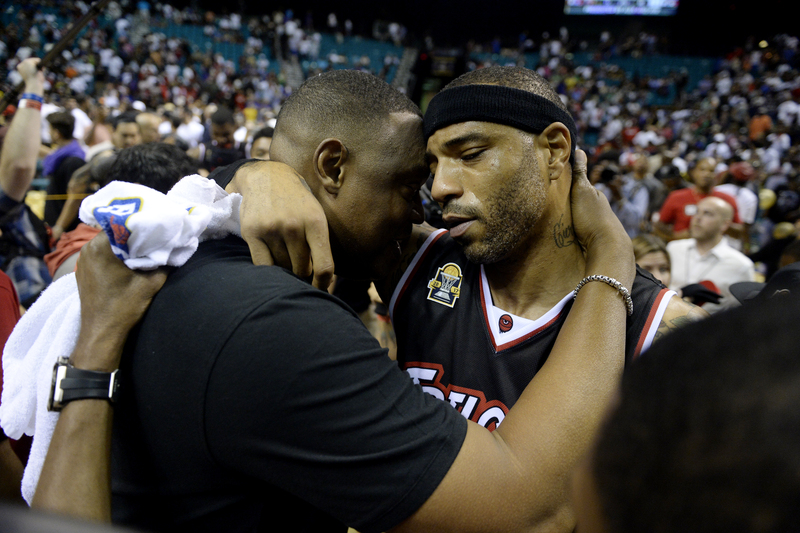 32) after McCants’ game-winning shot during the BIG3 championship game at the MGM Grand Garden Arena. Trilogy captured the first league title by beating 3 Headed Monsters 50-46. Kenyon Martin (No. 4) of Trilogy hugs head coach Rick Mahorn of Trilogy after winning the BIG3 championship game at the MGM Grand Garden Arena. Trilogy captured the first league title by beating 3 Headed Monsters 50-46. Trilogy bows for fans after winning the BIG3 championship game at the MGM Grand Garden Arena. Trilogy captured the first league title by beating 3 Headed Monsters 50-46.